It's Facebook Fridays! for November 25, 2016, and we are releasing the secrets of how to free yourself from jinxes, crossed conditions, bindings, curses, and just plain old bad luck! The Lucky Mojo Curio Company is holding a random drawing to give away 5 spectacular Deliverance spiritual supply prizes. 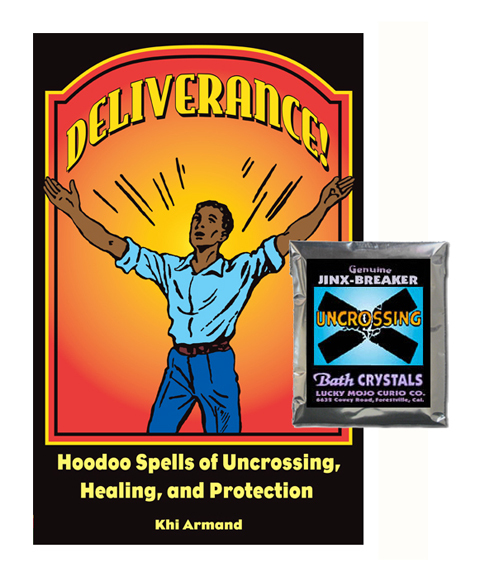 This week each lucky winner will receive a copy of Khi Armand's ground-breaking book, "Deliverance! ", which is filled with practical spiritual advice and conjure spells for healing and magical remediation -- plus a packet of genuine hand-made Lucky Mojo brand Uncrossing Bath Crystals to wash your troubles away! First thing tomorrow morning, we will select FIVE winners at random, announce their names here, and ask them to message this Facebook Page with their mailing addresses, so we can send them their FREE Deliverance products. We have a winner! In fact, we have 5 lucky winners! Our Facebook Fridays! winners for November 25, 2016 are: Renee Byrd, Sheila Lafi Simpson, Adrian Ryan, Jordan Mikena, and Melanie C. Harnage.